How Do Extrusive and Intrusive Environments Differ? With a background on how melts form and freeze, we can now introduce key features of the two settings intrusive and extrusive in which igneous rocks form. Different volcanoes extrude molten rock in different ways. Some volcanoes erupt streams of low-viscosity lava that ﬂood down the ﬂanks of the volcano and then cover broad swaths of the countryside. When this lava freezes, it forms a relatively thin lava ﬂow. Such ﬂows may cool in days to months. In contrast, some volcanoes erupt viscous masses of lava that pile into rubbly domes. And still others erupt explosively, sending clouds of volcanic ash and debris skyward, and/or avalanches of ash tumbling down the sides of the volcano. If magma stayed put once it formed, new igneous rocks would not develop in or on the crust. But it doesn't stay put; magma tends to move upward, away from where it formed. In some cases, it reaches the Earth’s surface and erupts at a volcano. 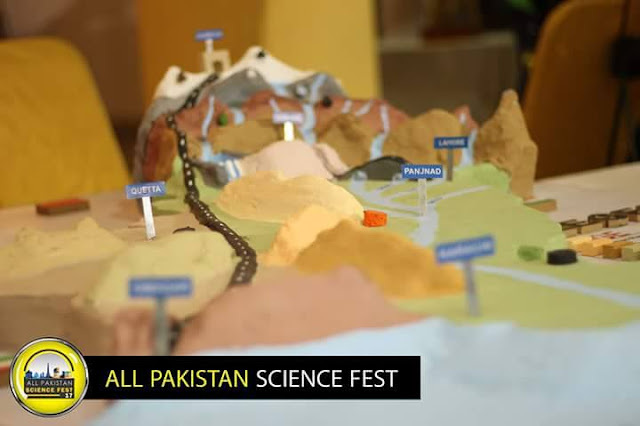 This movement is a key component of the Earth System, because it transfers material from deeper parts of the Earth upward and provides the raw material from which new rocks and the atmosphere and ocean form. Eventually, magma freezes and transforms into a new solid rock. Magma rises for two reasons. First, buoyancy drives magma upward just as it drives a wooden block up through water, because magma is less dense than the surrounding rock. Second, magma rises because the weight of overlying rock creates pressure at depth that literally squeezes magma upward. The same process happens when you step into a puddle barefoot and mud squeezes up between your toes. What Controls the Speed of Flow? Viscosity affects lava behaviour . Viscosity, or resistance to ﬂow, affects the speed with which magmas or lavas move. Magmas with low viscosity ﬂow more easily than those with high viscosity, just as water ﬂows more easily than molasses. Viscosity depends on temperature, volatile content, and silica content. Hotter magma is less viscous than cooler magma, just as hot tar is less viscous than cool tar, because thermal energy breaks bonds and allows atoms to move more easily. Similarly, magmas or lavas containing more volatiles are less viscous than dry (volatile-free) magmas, because the volatiles also tend to break apart silicate molecules and may also form gas bubbles. Maﬁc magmas are less viscous than felsic magmas, because silicon-oxygen tetrahedra tend to link together in magma to create long molecular chains that can’t move past each other easily, and there are more of these chains in a felsic magma than in a maﬁc magma. 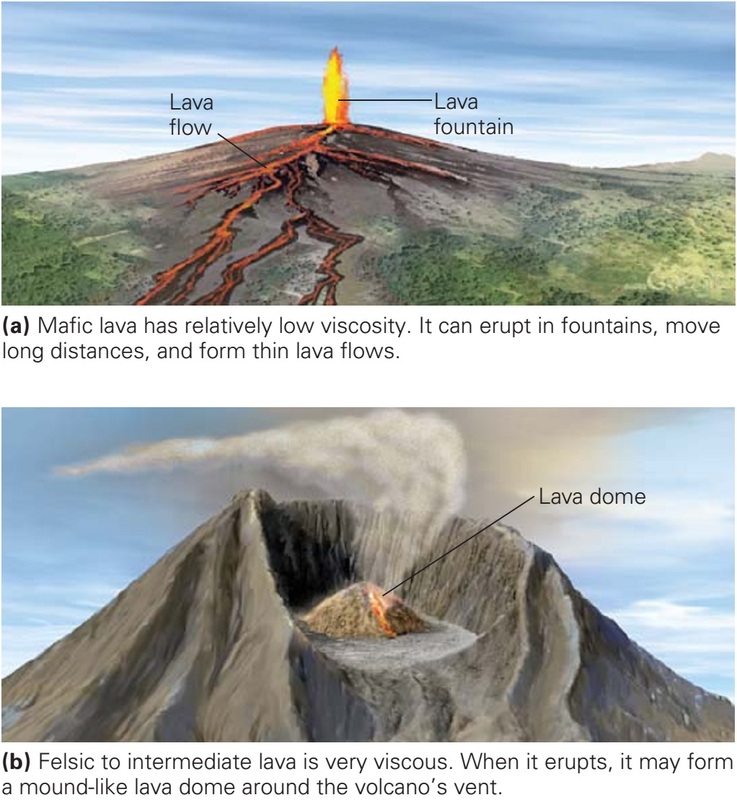 Thus, hotter maﬁc lavas have relatively low viscosity and ﬂow in thin sheets over wide regions, but cooler felsic lavas are highly viscous and may clump into a dome-like mound at the volcanic vent (figure above a, b). If a melt stayed at its point of origin, and nothing in its surroundings changed, it would stay molten. But melts don’t last forever. Rather, they eventually solidify or “freeze.” This process happens, in some cases, because volatiles escape from the melt, so that the freezing temperature rises if the melt’s temperature stays the same but its freezing temperature rises, it will solidify. Most often, however, freezing takes place simply when melt cools below its freezing temperature. Temperature decreases upward, toward the Earth’s surface, so magma enters a cooler environment automatically as it rises. If it is trapped underground as an intrusion, it slowly loses heat to surrounding wall rock, drops below its freezing temperature, and solidiﬁes. If melt extrudes as lava at the ground surface, it cools in contact with air or water. The time it takes for a magma to cool depends on how fast it is able to transfer heat into its surroundings. To see why, think about the process of cooling coffee. If you pour hot coffee into a thermos bottle and seal it, the coffee stays hot for hours; because it’s insulated, the coffee in the thermos loses heat to the air outside only very slowly. Like the thermos bottle, surrounding wall rock acts as an insulator in that it transports heat away from a magma only very slowly, so magma underground (in an intrusive environment) cools slowly. In contrast, if you spill coffee on a table, it cools quickly because it loses heat to the cold air. Similarly, lava that erupts at the ground surface cools quickly because the air or water surrounding it can conduct heat away quickly. Three factors control the cooling time of magma that freezes below the surface in the intrusive realm. Factors that affect the freezing of molten rocks. 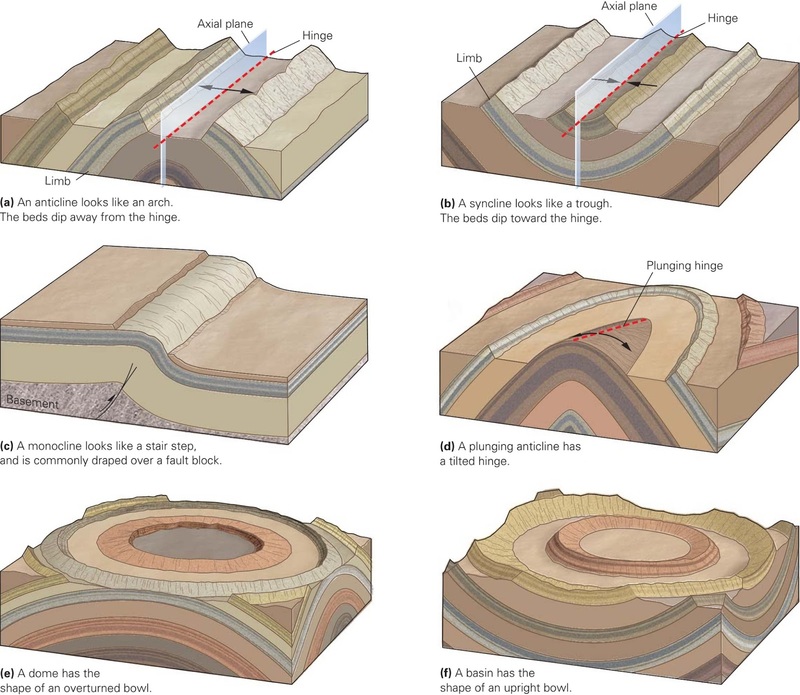 The depth of intrusion: Magma intruded deep in the crust, where it is surrounded by warm wall rock, cools more slowly than does magma intruded into cold wall rock near the ground surface. 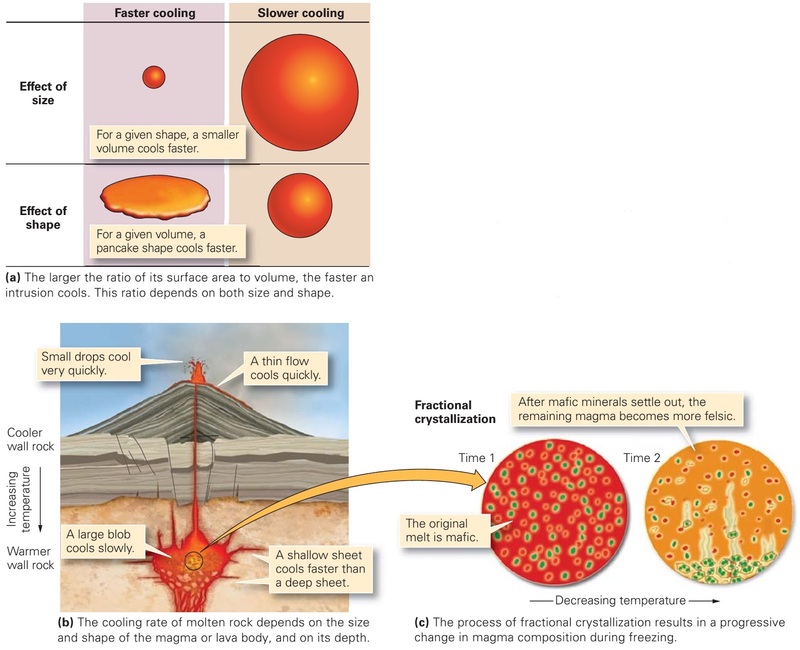 The shape and size of a magma body: Heat escapes from magma at an intrusion’s surface, so the greater the surface area for a given volume of intrusion, the faster it cools. Thus, a body of magma roughly with the shape of a pancake cools faster than one with the shape of a melon. And since the ratio of surface area to volume increases as size decreases, a body of magma the size of a car cools faster than one the size of a ship (figure above a, b). The presence of circulating groundwater: Water passing through magma absorbs and carries away heat, much like the coolant that flows around an automobile engine. Most people are familiar with the process of forming ice out of liquid water cool the water to a temperature of 0nC and crystals of ice start to form. Keep the temperature cold enough for long enough and all the water becomes solid, composed entirely of one type of mineral water ice. The process of freezing magma or lava is much more complex, because molten rock contains many different compounds, not just water, so during freezing of molten rock, many different minerals form. 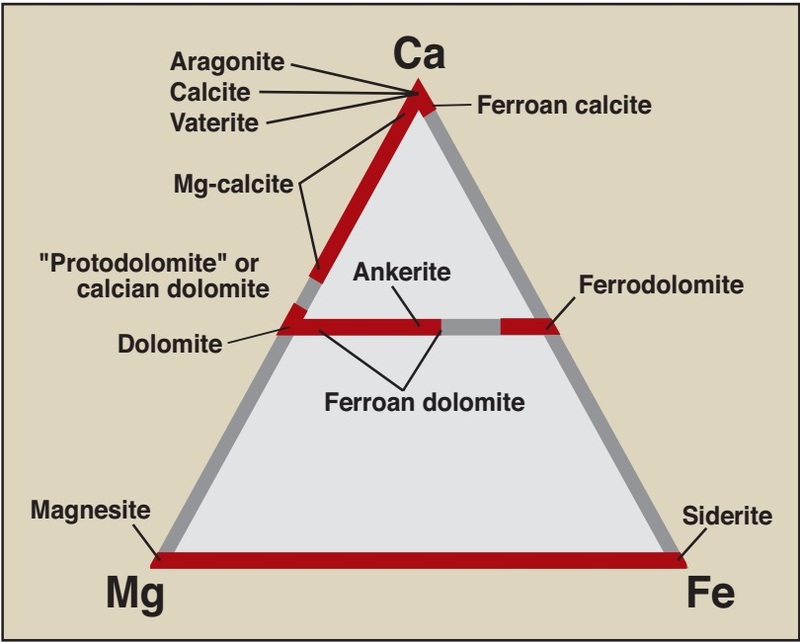 Further, not all of these minerals form at the same time (Bowen’s Reaction Series). To get a sense of this complexity, let’s look at an example. When a maﬁc magma starts to freeze, maﬁc (iron- and magnesium-rich) minerals such as olivine and pyroxene start to crystallize ﬁrst. These solid crystals are denser than the remaining magma, so they start to sink (figure above c). Some react chemically with the remaining magma as they sink, but some reach the ﬂoor of the magma chamber and become isolated from the magma. This process of sequential crystal formation and settling is called fractional crystallization it progressively extracts iron and magnesium from the magma, so the remaining magma becomes more felsic. 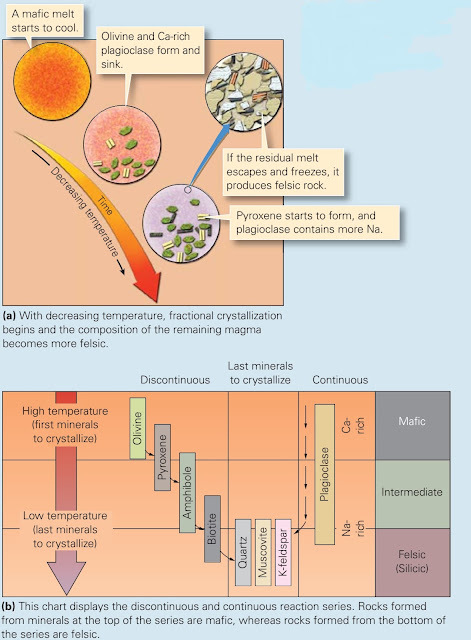 If a magma freezes completely before much fractional crystallization has occurred, the magma becomes maﬁc igneous rock. But freezing of a magma that has been left over after lots of fractional crystallization has occurred produces felsic igneous rock. In the 1920s, the Canadian geologist Norman L. Bowen began a series of laboratory experiments designed to determine the sequence in which silicate minerals crystallize from a melt. First, Bowen melted powdered maﬁc igneous rock by raising its temperature to about 1280C. Then he cooled the melt just enough to cause part of it to solidify. Finally, he “quenched” the remaining melt by submerging it quickly in cold mercury. Quenching, which means sudden cooling to form a solid, transformed any remaining liquid into glass. The glass trapped the earlier-formed crystals within it. Bowen identiﬁed mineral crystals formed before quenching with a microscope, and he analyzed the chemical composition of the remaining glass. Bowen's reaction series indicates the succession of crystallization in cooling magma. After experiments at different temperatures, Bowen found that, as new crystals form, they extract certain chemicals preferentially from the melt (figure above a). Thus, the chemical composition of the remaining melt progressively changes as the melt cools. Bowen described the speciﬁc sequence of mineral-producing reactions that take place in a cooling, initially maﬁc, magma. This sequence is now called Bowen’s reaction series in his honour. Let’s examine the sequence more closely. In a cooling melt, olivine and calcium-rich plagioclase form ﬁrst. This plagioclase reacts with the melt to form more, but different plagioclase; the plagioclase formed at a later stage contains more sodium (Na). Meanwhile, some olivine crystals react with the remaining melt to produce pyroxene, which may encase early olivine crystals or even replace them. However, some of the early olivine and Caplagioclase crystals settle out of the melt, taking iron, magnesium, and calcium atoms with them. By this process, the remaining melt becomes progressively enriched in silica. As the melt continues to cool, plagioclase continues to form, with later-formed plagioclase having progressively more sodium than earlier-formed plagioclase. Pyroxene crystals react with melt to form amphibole, and then amphibole reacts with the remaining melt to form biotite. All the while, crystals continue to settle out, so the remaining melt continues to become more felsic. At temperatures of between 650°C and 850°C, only about 10% melt remains, and this melt has a high silica content. At this stage, the ﬁnal melt freezes, yielding quartz, K-feldspar (orthoclase), and muscovite. On the basis of his observations, Bowen realized that there are two tracks to the reaction series. The “discontinuous” reaction series refers to the sequence olivine, pyroxene, amphibole, biotite, K-feldspar-muscovite-quartz in that each step yields a different class of silicate mineral. The “continuous” reaction series refers to the progressive change from calcium-rich to Na-rich plagioclase: the steps yield different versions of the same mineral (figure above b). It’s important to note that not all minerals listed in the series appear in all igneous rock. For example, a maﬁc magma may completely crystallize before felsic minerals such as quartz or K-feldspar have a chance to form. The study of rocks begins by examining a rock in an outcrop. If the outcrop is big enough, such an examination will reveal relationships between the rock you’re interested in and the rocks around it, and will allow you to detect layering. 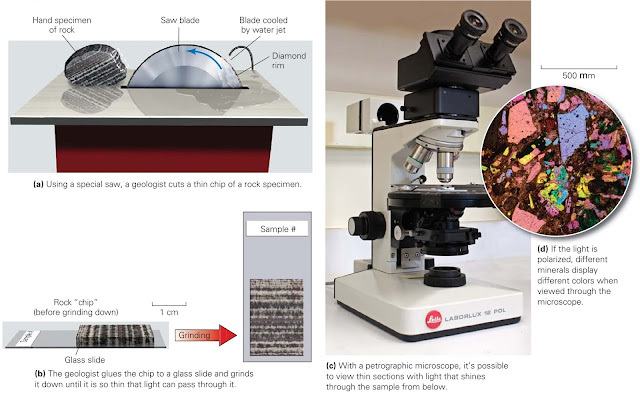 Geologists carefully record observations about an outcrop, then break off a hand specimen, a ﬁst-sized piece, that they can examine more closely with a hand lens (magnifying glass). Observation with a hand lens enables geologists to identify sand-sized or larger grains, and may enable them to describe the texture of the rock. Studying rocks in thin section. Examples of three major rock groups. Beginning in the 18th century, geologists struggled to develop a sensible way to classify rocks, for they realized, as did miners from centuries past, that not all rocks are the same. Classiﬁcation schemes help us organize information and remember signiﬁcant details about materials or objects, and they help us recognize similarities and differences among them. By the end of the 18th century, most geologists had accepted the genetic scheme for classifying rocks that we continue to use today. This scheme focuses on the origin (genesis) of rocks. 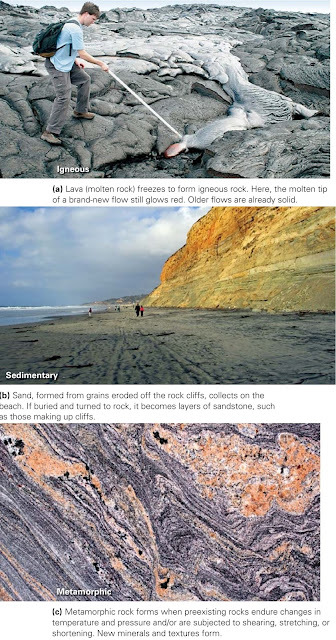 Using this approach, geologists recognize three basic groups: (1) igneous rocks, which form by the freezing (solidiﬁcation) of molten rock (figure above a); (2) sedimentary rocks, which form either by the cementing together of fragments (grains) broken off preexisting rocks or by the precipitation of mineral crystals out of water solutions at or near the Earth’s surface (figure above b); and (3) metamorphic rocks, which form when pre-existing rocks change character in response to a change in pressure and temperature conditions (figure above c). Metamorphic change occurs in the solid state, which means that it does not require melting. 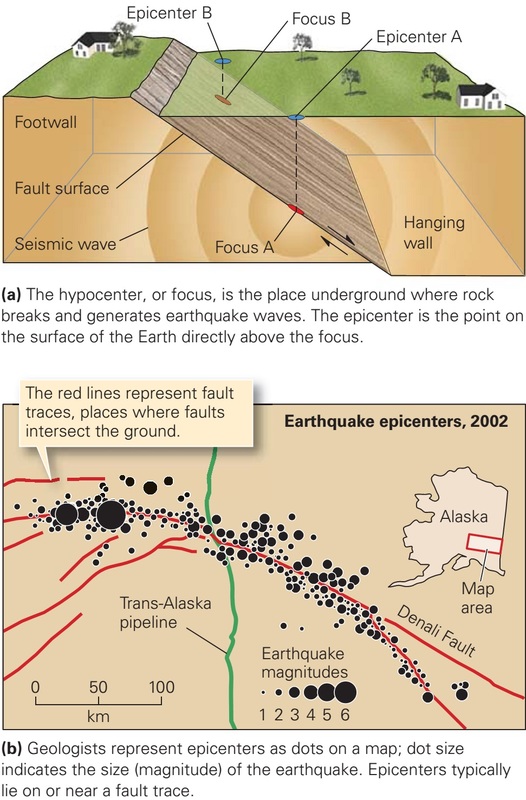 In the context of modern plate tectonics theory, different rock types form in different geologic settings (figure below).